Look at that pie. It looks tasty. But why in the world is it covered in numbers? That's a bit of an unusual way to decorate a pie. I know the secret, and soon you will too. A hint: today is a Holiday! I'm not making it up, and I'm not talking about St. Patrick's Day, either. It is a day beloved by junior high students, high school students, mathematicians, and pie-lovers (and those who just like an excuse to celebrate another day). Woah, what do all of those people have in common? That's a pretty random collage of groups. The reason it all works out is because it's Pi day! And don't worry, that's not a typo. I spelled it right. It really is Pi day! But, for those of us who love pie, we stretch it to include an "e" at the end of that first word. 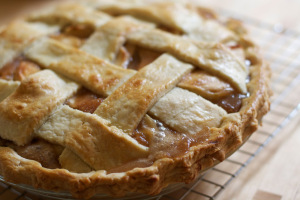 To me, it's Pie Day just as much as it is Pi Day. It's another excuse to eat Pie. Thanksgiving is too far away. So here's some info for you to gobble up, along with a pie, to give you a little background on this day. Even if you knew about this day and have a pie in the oven already, hopefully there's something new you can learn. It symbolizes 3.14159265... etc. It has trillions of calculated digits, but goes on forever. It is better known as 3.14. It is used to calculate the circumference and area of a circle. This has many applications in real life, so it is taught quite heavily in schools. Today is March, 3, 2014 (3/14/14). The third month, and the 14th day. 3.14, or pi. The day's founder is credited to Larry Shaw. Started in 1988, they celebrated 3.14 with pi activities and pie. Math teachers and their students mostly celebrate this day. They do activities involving pi and circumference. They measure circles and eat pies. They bring them, they eat them, and they have pie-eating contests. Fun abounds on Pi day in the classrooms (and though the kids are probably loving the pie they get to eat, they do get to practice with pi in formulas and other scenarios.) It sounds like a blast, so why not take it into your own home? Bake a pie! (Or buy a pie) Use the excuse to invite family and friends over. They will hopefully have fun with the spontaneity of it. You could even measure the circumference and area of the pi you make. If nothing else, maybe they'll just like the pie and the time spent with you. 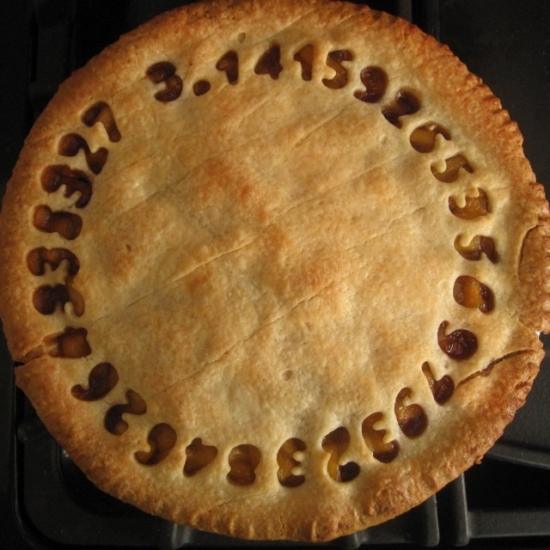 If you get really into this day (or just want another reason to bake a pie), Pi Approximation Day is July 22, if you divide 7 from 22 (22/7), you get 3.14. Mark it on your calendars! Below is a recipe to try if you want to make a pie today.